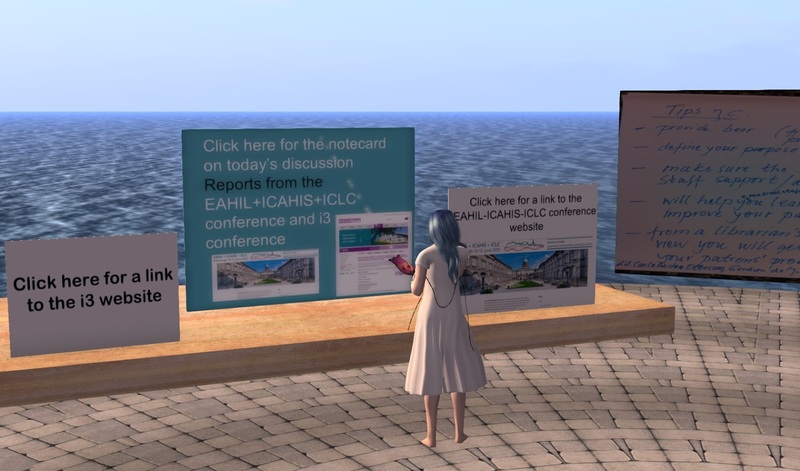 What: Reports from the EAHIL+ICAHIS+ICLC 2015 Workshop (Health librarians) (https://eahil2015.wordpress.com/) and the i3 conference (http://www.rgu.ac.uk/research/conferences/i-2015) both held in June 2015. This meeting is held in the 3D virtual world, Second Life. Marshall Dozier (Pancha Enzyme in SL, and President of EAHIL), Sheila Webber (Sheila Yoshikawa in SL, who presented at EAHIL+ICAHIS+ICLC and i3) and Vicki Cormie (Ishbel Hartman in SL, co-organiser of EAHIL+ICAHIS+ICLC) will give their impressions of the conferences. This will include session highlights, reflections on organising the conference and feedback from delegates at EAHIL+ICAHIS+ICLC.